WHAT ELSE CAN I EXPECT FROM AN ONLINE MASTER'S IN POLITICAL SCIENCE PROGRAM? Political science is the multidisciplinary branch of social science dedicated to studying the theory and practice of politics in different government systems, as well as how wealth and resources are distributed among citizens. The field of political science can further be subdivided into niche subjects like comparative politics, international relations, public administration, and global health. In the course of their work, political scientists draw on history, sociology, anthropology, psychology, economics, and other social science disciplines related to politics and government, as well as law, ethics, policy, and advocacy. A large number of political science professionals begin their careers at the college level. While many complete their education with a bachelor's degree, a master's is considered the minimum educational attainment level for political scientists, teachers, and other popular careers in political science. The master's in political science pathway will introduce students to complex concepts related to the executive, judicial, and legislative functions of different government systems, as well as historical impacts and contemporary issues affecting politics worldwide. Many of today's students are choosing to earn their master's in political science online, rather than in a classroom. Web-based students follow the same rigorous curricula as their brick-and-mortar counterparts, leading to a comparable number of post-graduation job opportunities. The asynchronous (or self-paced) format of most online master's in political science degree programs is also ideal for students with other commitments that may interfere with campus-based education, such as part-time employment or family obligations. Learn more about what you can do with an online master's in political science and what kind of career opportunities you can look forward to with this comprehensive guide. WILL AN ONLINE MASTER'S IN POLITICAL SCIENCE PROGRAM PROVIDE ME WITH THE SKILLS I NEED TO ADVANCE MY CAREER? A master's in political science degree will build on the foundational areas of undergraduate education while also introducing more advanced theories and approaches to the field. The curriculum leans heavily on academic research and comparative studies. Master's degree programs often allow students to focus their studies on a specialized area of political science, such as comparative politics, political economy, or global relations. Those who earn a degree specialization will be highly qualified to enter the workforce and seek job opportunities within their scope of expertise. WILL AN ONLINE MASTER'S IN POLITICAL SCIENCE PROGRAM WORK WITH MY SCHEDULE? Master's in political science online programs provide a flexible, user-friendly alternative to traditional postsecondary education. Students are able to download course lectures and readings, participate in virtual discussions with other students, submit written assignments, take exams and communicate with their professors on their own schedule. Current technology also enables them to study away from their home computer using a laptop, tablet, smartphone and other portable devices with Wi-Fi capabilities. WHAT JOBS CAN I GET WITH MY MASTER'S IN POLITICAL SCIENCE? A master's degree is considered the minimum educational attainment level for most political scientist jobs. Additionally, the master's can serve as a good stepping-stone for students who plan to earn a doctoral degree political science, which will enable them to work as political science professors or academic researchers. Other popular career paths in political science ― including public relations, fundraising, and journalism ― are attainable with a bachelor's degree, so graduates with a master's will be well-positioned for these occupational roles, as well. 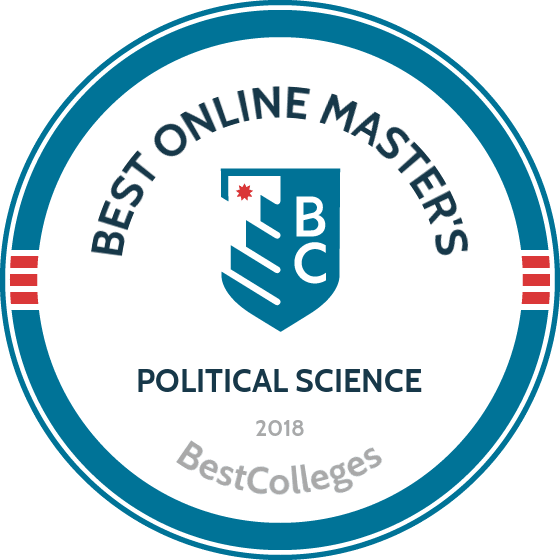 WHAT ARE THE BEST ONLINE MASTER'S IN POLITICAL SCIENCE PROGRAMS? Choosing a program is an incredibly personal decision, and only you can properly evaluate whether a target school's strengths match your educational needs. The following ranked list of schools should serve as a helpful starting point in your search for the best online master's in political science programs in the United States. Our ranking is based on the courses schools offer, available specializations, student outcomes, career support services, and other criteria used to determine academic excellence. If you are considering an online master's degree in political science, be sure to contact admissions specialists at different colleges and universities to learn more their about specific requirements and offerings. The University of Illinois at Springfield offers 31 bachelor's and 20 master's degree programs, including a master's of arts in political science. The 40-credit program can be completed entirely online and is designed for students who want to pursue a career in politics, teach at the collegiate level, or pursue an advanced degree. The curriculum includes 12 credits of core courses and 28 credits that can be completed through electives and internships. Four 16-credit areas of emphasis are offered, though they are not required. These concentrations include American national and state politics, comparative politics / international relations, political theory, and public law and policy. Finally, students must complete a closure exercise to conclude the program. Students can choose one of three types of closure exercises: a thesis, a comprehensive exam, or a participant/observer case study. Applicants must have a bachelor's degree with a minimum GPA of 3.0 to be considered. The University of West Florida, located in Pensacola, offers 45 undergraduate and 25 master's degree programs in fields like health sciences, education, maritime studies, and administration. The school offers 18 entirely online graduate degree programs with more than 30 specializations, including a master's of arts in political science. This 33-credit program is designed for students interested in public policy, comparative politics, and international relations. The online political science master's offers two concentrations: political science and security and diplomacy. The program offers a thesis and non-thesis option, each requiring 21 credits of study in core courses with at least a B grade. The curriculum includes courses in political theory, international relations, comparative politics, and research methods. Applicants must have a bachelor's degree with a minimum GPA of 3.25 to be considered. The program may not be available in all states, and UWF encourages out-of-state students to review the school's State Authorization Status before applying. Virginia Tech is a world-class institution with a catalog of approximately 250 undergraduate and graduate degree programs delivered to about 33,000 students. Virginia Tech Online offers entirely online and hybrid master's degree programs in fields like computer science, education, ocean engineering, and information technology. The 30-credit master's of arts in political science is offered in three formats: entirely online, traditional on-campus study, and a hybrid accelerated format. Students in this online political science master's degree enjoy small classes with a 7-to-1 student-to-teacher ratio. The program prepares students for doctoral work, or careers in government, nonprofit organizations, or private sector research. The curriculum includes courses in public policy, political theory, U.S. foreign policy after 9/11, and research methods. A thesis, based on a research project, is required to complete the program. Students can also add a certificate in environmental politics or policy and security studies to their degree. Liberty University’s fully online political science master’s degree focuses on the impact and nature of politics in society, integrating a variety of fundamental political science skills. The 36-hour online master’s degree in political science program allows the transfer of up to 50% of approved program hours. Coursework includes political philosophy, economics and public policy, geopolitics and international diplomacy, and political science, public policy, and statesmanship. This online master’s in political science prepares graduates for a potential career as a lobbyist, compliance manager, regulatory affairs manager, or political scientist. Applicants must apply online and pay a non-refundable application fee of $50. Students must submit their unofficial and official college transcripts, a degree from an accredited university or institution with a minimum 3.0 GPA, and—if non-native English-speakers—acceptable TOEFL, IELTS, or iTEP scores. In addition to multiple program accreditations, Liberty University receives accreditation from the Southern Association of Colleges and Schools Commission on Colleges. Sam Houston State University’s master’s in political science online suits both recent graduates and those looking to advance their professional career. This political science master’s online degree offers two paths: a 36-credit non-thesis option and a 30-credit thesis option, culminating in a thesis statement. Students pay tuition per 12-hour semester, rounding averaging roughly $336 per credit hour. Coursework explores comparative politics, american politics, and international relations. Students may choose between five and nine political science electives, depending on their enrollment in the thesis or non-thesis option. Applicants must submit a graduate studies application, an application fee, official transcripts with a minimum undergraduate GPA of 3.0, official GRE scores, two letters of recommendation, a written statement of intent, and a writing sample of professional or scholarly work. Along with individual program accreditations, SHSU holds accreditation through the Southern Association of Colleges and Schools. The curriculum for a master's in political science degree track will cover a wide breadth of academic subjects. Students should expect coursework in U.S. and international politics, political theory, politics and religion, criminal justice, legislation, public administration, public health, and global economics. Those who elect to follow a specialization pathway will be required to complete five to 10 courses exclusively dedicated to that particular field ― though specializations may not be available at certain colleges and universities. The master's in political science will sometimes culminate in a capstone course, or comprehensive research project that allows students to apply the skills and knowledge they have gained to address a contemporary political issue or trend. If a capstone project is not required, then students will usually take a final exam instead. Many master's in political science recipients choose to study abroad during some or all of their degree program; overseas learning is required in some cases. It's crucial to research the accreditation status of an MBA program before fully committing to it. In the U.S., online master's programs in political science do not receive programmatic accreditation. However, students should make sure that their college or university has received regional or national accreditation before committing to it. Historically, the job outlook for political science professionals with a master's degree has been somewhat mixed. On one hand, those who receive a master's will enjoy lower unemployment rates than their counterparts with lower credentials. The Bureau of Labor Statistics (BLS) notes that the average master's degree recipient faces an unemployment rate of 2.4%; by comparison, the unemployment rate for bachelor's and associate degree-holders is 2.8% and 3.8%, respectively. On the other hand, political science is a relatively small, specialized field with little to no job growth projections in the years to come. U.S. News & World Report notes that political scientists currently face an unemployment rate of 7.9%. Comparatively, the average unemployment rate for all occupations nationwide currently sits at 4.5%. The job outlook is stronger for professionals working in different areas of political science. Public relations specialists, for instance, currently hold an unemployment rate of 1.1%. The table below looks at projected job growth for four of the most common careers in political science. Like unemployment rates and projected job outlook, the salary potential for someone with a master's in political science will often come down to their specific job title. Other factors to consider include experience level, employer size, and city/state of employment. The next table looks at 20-year earnings growth estimates for five of the most common careers in political science for master's degree recipients. All five occupations experience salary growth of at least 43% after 20 years on the job. Campaign directors reported the highest growth rate: a staggering 162.5% increase in earnings between the entry-level and late-career stages. Fundraisers ranked second with 82.2% salary growth, followed by campaign managers with 45.7% growth. Those who earn a master's in political science will be qualified for dozens of top-level jobs once they have completed their degree program, although individual eligibility may depend on specialization areas. Four popular career pathways in political science are outlined below. Political Scientists: Political scientists research the establishment, development, and current state of different government systems. They study history, current events, political trends, and statistics in order to back up their theories, and often publish their work and present findings at professional conferences. Political Science Teachers (Postsecondary): Political science is widely taught in U.S. colleges and universities, primarily at the undergraduate level. Political science teachers often lead courses related to their area(s) of expertise, and may also conduct academic research of their own and publish their work in peer-reviewed journals. Public Relations Specialists: Public relations specialists (PR specialists for short) are responsible for cultivating a positive image for individuals and organizations they represent. They often draft press releases, schedule public speaking engagements, reach out to journalists, and oversee social media activity related to their clients. Public Relations and Fundraising Managers: PR and fundraising managers create promotional materials and secure funding for individuals and organizations they represent. In politics, these personnel often work for candidates, elected officials, advocacy groups, and other entities with a stake in the U.S. government. International Political Science Association: UNESCO established IPSA in 1949 to "support the development of political science in all parts of the world, building academic networks linking East and West, North and South". Membership is offered at individual, institutional, and collective rates.